Showers early, then cloudy in the afternoon. High 52F. Winds NW at 10 to 20 mph. Chance of rain 60%..
Cloudy skies with a few showers after midnight. Low 41F. Winds N at 15 to 25 mph. Chance of rain 40%. 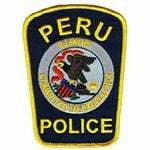 Peru Police responded to a medical call Saturday night in the area of Route 251 and Interstate 80. When they arrived, they found 64-year-old Leonard Petty of Indianapolis unresponsive behind the wheel of his car in the middle of an intersection. Petty was taken to Illinois Valley Community Hospital and treated in the Emergency Room. While he was there, police found he had been driving on a suspended Indiana license. Petty was issued a notice to appear.